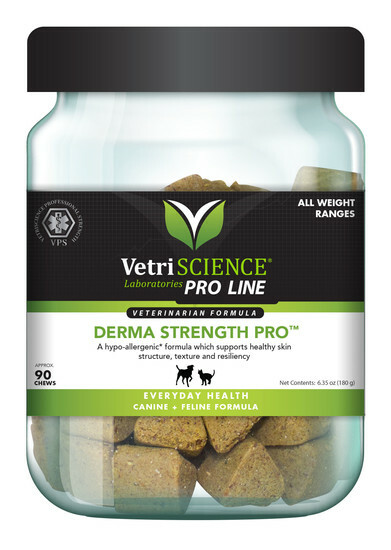 Derma Strength™ Pro is an advanced formula that is available in a palatable chew for easier delivery, and it is recommended for overall skin health and normal recovery after surgery. 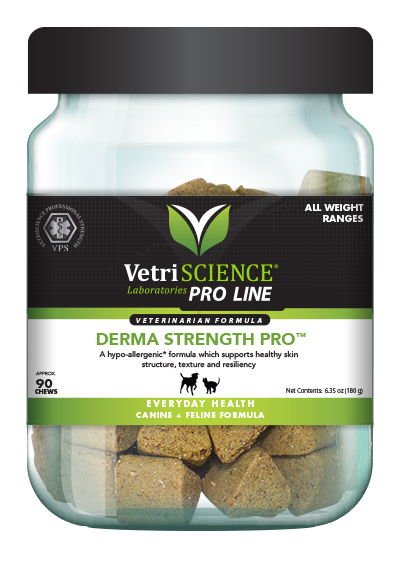 Derma Strength Pro is designed to support the structural foundation of your pets skin from the inside out. Combining Phytosome technology with proven skin support ingredients, Derma Strength Pro features essential fatty acids, powerful antioxidants, and other highly bioavailable nutrients shown to be beneficial insupporting pets with occasional dermatologicalsensitivities. Derma Strength Pro also contains hyaluronic acid and ingredients from three different classes of Flavonoids: anthocyanins, flavanones, and flavanols. Extra Support: Double the dose for the first 4 weeks. Click here for product sell sheet. sunflower lecithin, sweet potato powder, vegetable oil, water. CAUTION:If animals condition worsens or does not improve, stop product administration and consult your veterinarian. WARNING:Keep out of the reach of children and animals. In case of accidental overdose, contact a health professional immediately.